The Saint Paul Athletic Club is re-opening next month, and tonight I got a first glimpse at the restorations inside this grand dame. At nearly 100 years old, she is lovely, and I couldn’t stop staring at the ceilings and chandeliers. This is day nine of Photo 365. 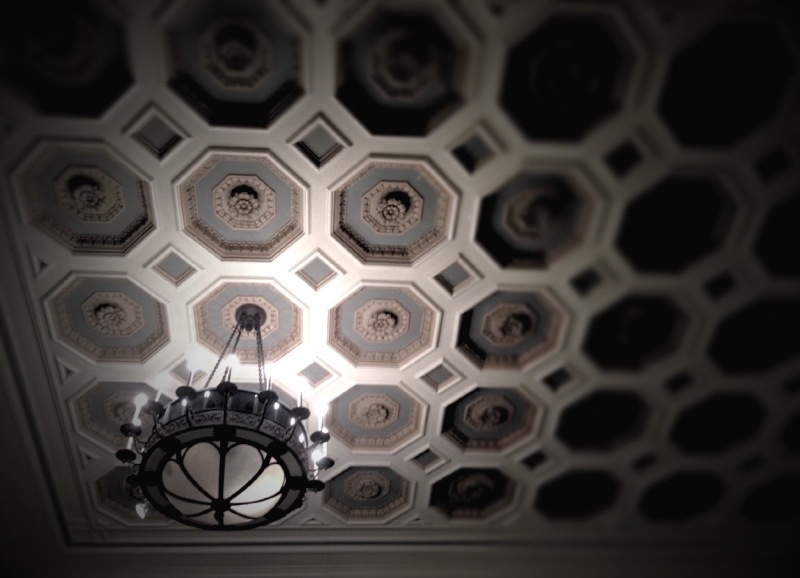 This entry was posted in Photography and tagged Athletic Club, Photo 365, Saint Paul. Bookmark the permalink. This stunning ceiling seems a bit out of place in an athletic club – though I suppose the crunch and pilate warriors would get a kick of of it. I think it would be much more suited to, say, my bedroom. But then, I spend too many sleepless nights staring at a blank white space as it is; imagine how much more shut-eye I’d forgo were I to get lost in surroundings such as this?! Yet I’m certainly happy to be lost in these and other lovely spots during waking hours, thanks to the photo-y machinations of Colleen McGuire over at Travel Snapshots.